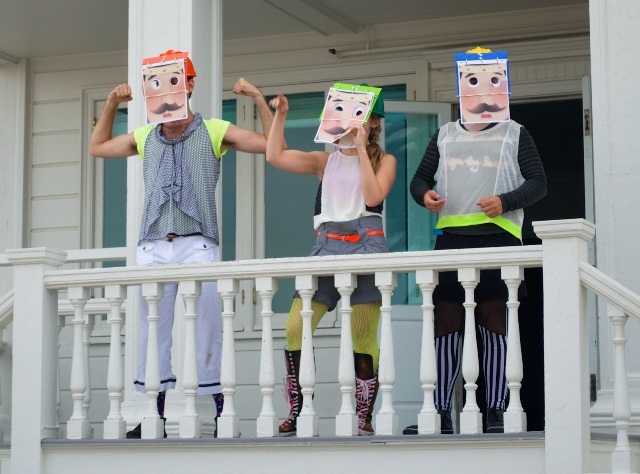 Rogue Artists Ensemble has been performing its FREE summer family show HYPERBOLE: bard around the city over the last few weeks, offering performances at Carlson Park in Culver City, the Annenberg Community Beach House in Santa Monica, and Grand Park in Downtown Los Angeles. 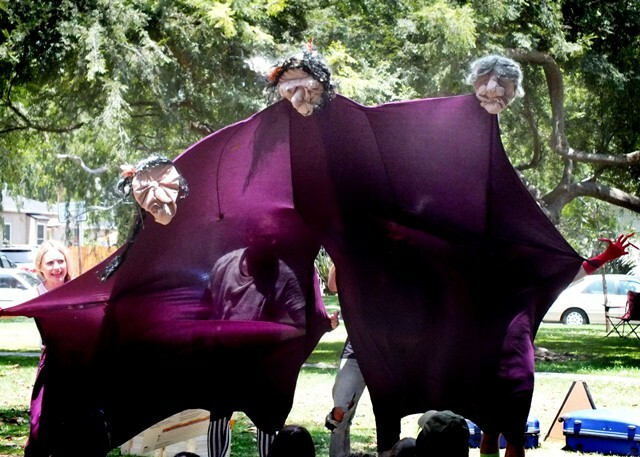 I caught their show this afternoon in West Hollywood Park, which will be the company’s final location for the show. 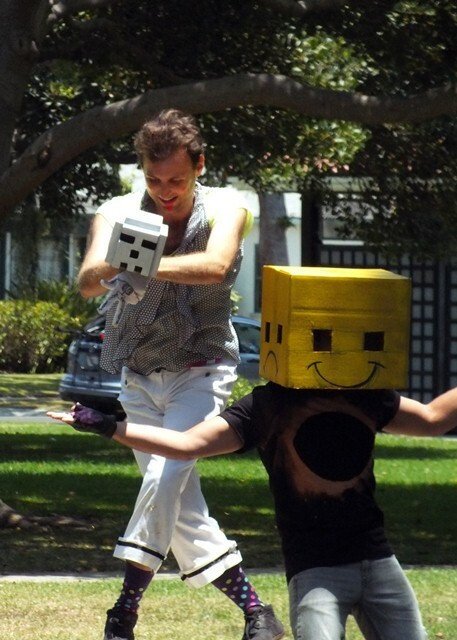 One last performance takes place tomorrow, Sunday July 28, in West Hollywood Park at 4:00 pm. The hour-long G-rated show directed by Sean T. Cawelti is a fresh, original, and fun introduction to Shakespeare that even the youngest members of the family will enjoy, combining puppetry, mask work, clowning, music, and a whole lot of fun. Adults will love the way the cast weaves famous lines and situations from over a dozen of Shakespeare’s plays and sonnets into the action. Kids will love the big and bright theatrical elements that must seem quite magical to them, judging from the rapt faces of the children in the audience. The Rogues’ HYPERBOLE projects normally have two rules – they contain no human faces or spoken text. But in the case of Shakespeare, it would be next to impossible to create a show without at least some of his text. This one ends up being a hybrid. Some of the scenes rely on music, action, and no words to communicate the story while others take Shakespeare’s words and integrate them in creative ways. A 5-member ensemble that includes Daniel Mk Cohen, Taylor Coffman, Sam Gold, Derek Petropolis, and Miles Taber, plays all the parts. One of the most fascinating aspects is watching the actors instantly change when they put on a mask; body positioning, voice, mannerisms, tone – everything shifts in a moment. The prologue sets up the device as a troupe of actors arrive, discover a mountain of suitcases full of props, and begin to bring the scenes to life. It’s an easy way to indoctrinate the audience into the Rogues’ theatrical world and show them what to expect. In the opening scene, a square-headed Hamlet can’t decide if he’s having a good or bad day until Falstaff appears and starts to cause some trouble. The iambic pentameter song is a comedic lesson on what it is and what it sounds like, done as a kind of “Whose Line is it Anyway” singing takeoff. There’s even a one-liners speech that consists of text from characters who only have one line in the bard’s plays. Other highlights include a terrific sketch that pokes fun at Shakespeare’s many cross-dressing love scenes, with plot twists and a final button you’ll never be able to predict; a version of Romeo and Juliet with an extended, and hilarious, death scene that won’t scare the kids but will make them laugh; and a psychic reading/audience participation scene done by the three witches from Macbeth [pictured above]. A final sequence salutes the kings, queens, storms, sword fights, and everything else not previously touched upon. This one’s good for the whole family – it’s free – and it’s only an hour long. Go!